Use of Building Information Modeling (BIM) allows us to increase communication and collaboration from the initial project planning stages. Our team leads regular clash detection meetings throughout each phase of the project. We discuss challenges and solutions and the real-time feedback is integral in setting a project up for success. The increased communication provides a better platform for planning during the early stages of construction. This allows us to create a more efficient schedule, which ultimately results in lower costs for our clients. Our Virtual Construction department functions as a liaison between our operations team, clients, designers and subcontractors, facilitating all the practical applications of Building Information Modeling (BIM) during projects. As one of the Top 30 BD+C Virtual Construction firms in the country, we are heavily invested in tools that promote efficiency and collaboration and increase productivity. We utilize 3D laser scanners during the early phases of most projects to document existing conditions for interior shell spaces, floor levelness and as-built conditions. We also utilize this tool throughout construction to ensure quality installation for trades such as rebar, façade installation and other critical path items. We employ the latest clash detection software and techniques to analyze the design and coordination of each discipline to ensure constructability, quality and performance. The clash detection meetings allow the various parties involved on a project to provide feedback and comments regarding the shape of the design. By utilizing the latest robotic layout tools, we are able to confirm control points and layout coordinates to ensure precision and quality control. Throughout this process, we capture each of these data points and are able to provide an electronic as-built record for our clients at the end of a project. 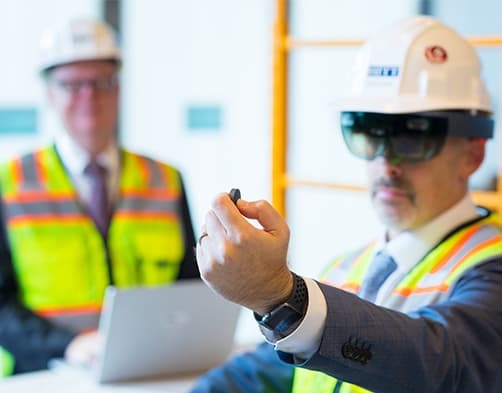 At HITT, we employ our virtual construction services on a variety of project types including corporate office, multifamily, education, healthcare and technology. Please click to learn more about our virtual construction capabilities. Our Virtual Design and Construction team created these educational videos, which highlight various aspects of Building Information Modeling (BIM) and the services offered by our team. For more information, please visit our YouTube channel.